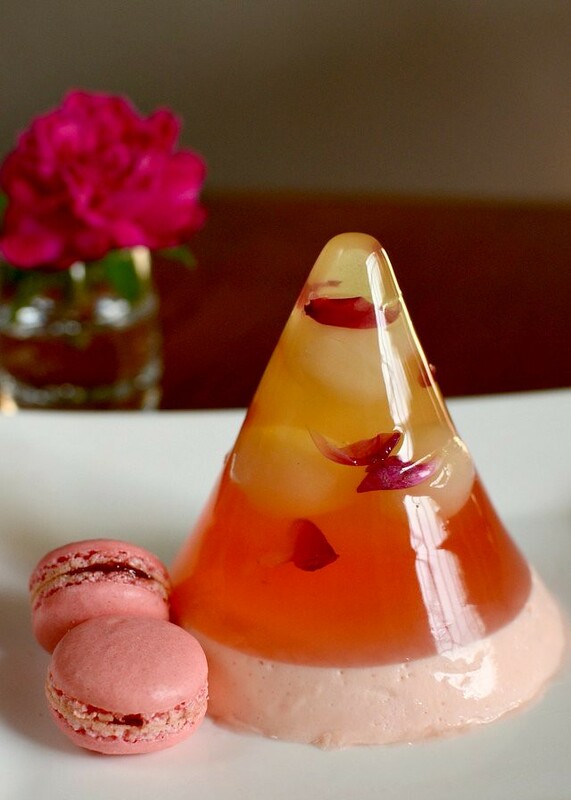 Pierre Hermes' famous Ispahan macaron turned jelly: rose-flavored clear jelly with longans and rose petals from my garden and a bottom layer of creamy rose jelly. The rose petals had a real nice scent; yum! 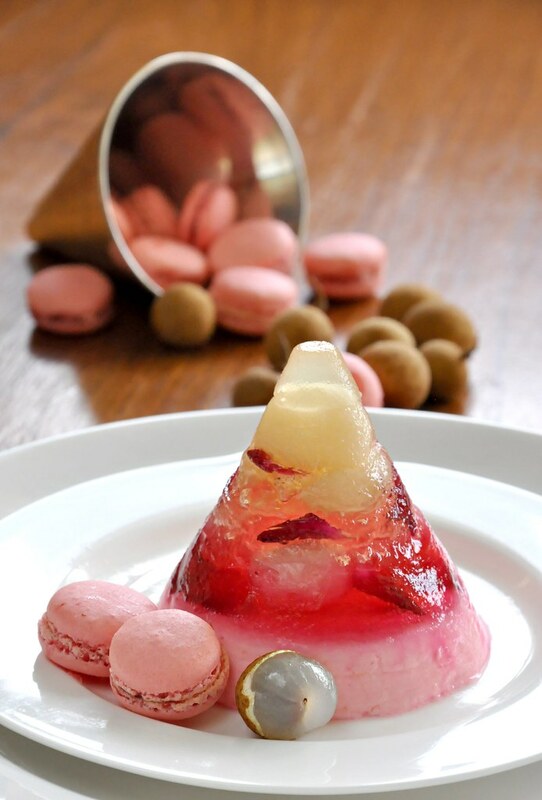 I woke up this morning and found that Billy has posted an Ispahan jelly for the month-long Jellyriffic challenge by Royal Selangor Pewter. I was going to post one too and I usually post at midnight but I better post now before Billy points a finger at me! I totally missed Pierre Hermes' most popular macaron, the Ispahan, when I was in Paris last year. Dang. I'm still kicking myself for that. The Ispahan is a pretty macaron which all ladies can't resist: pink rose macarons sandwiched with fresh raspberries, lychees (litchi) and rose buttercream. That Pierre Hermes had nailed both looks and taste in one phenomenal macaron. The real Ispahan is an old Iranian rose, 'old' as in roses that have not been hybrided (excuse my grammer). Old roses are highly scented and in India, the Middle East and the region around it, roses are commonly used to flavor desserts. Think Turkish delights and gulab jamun. Yum. I have a red rose bush which is highly scented and has small, open petals, just like the Ispahan and I consider it a joy to have the plant right at my gate. It blooms everyday and when I pass by, I stop to smell and thank the plant. One sniff and I always feel good. The power of scent. I like to use the petals for decorating my rose chiffon cake, a cake that never fails to please even the guys. I've used longans (instead of litchis but I'm not sure if the real Ispahan has litchis or longans) because they are smaller and also because I dislike canned litchis. Fresh litchis are sweet, juicy and have a stronger flavor than longans and are very addictive to eat but canned litchis are mushy soft and bland. Longans, although not as strongly flavored, have a good bite and are very sweet too. I am lucky to have some fresh longans left on my tree for the photos. I'm so thrilled to have used basil, tomatoes and longans from my garden and pink guavas and bunga telang from a friend for the Jellyriffic challenge. Now I have to think of a jelly using my kampung chickens! The first Almost Ispahan jelly I made was a hit with my family (I only post recipes that taste good or my readers'll kill me) but being the prefectionist that I am, I was bothered by the jelly which turned out orange instead of pink. I made another one but left it in the freezer too long and the jelly froze. I was going to do another, hopefully with real raspberries when my terrific friend Yo returns to KK from her travels. But never mind, I'll go with whatever I have and move on. The first Almost Ispahan Jelly I made didn't have the right shade of pink but it was yummy. 1) Using a tiny metal pot, dissolve the gelatine powder with the juice. Cool. 2) Rinse and stand the Munro mould in a mug. Put 1 tsp of the longan jelly into the tip of the mould, wait a minute and add one canned longan. Let it set. 3) Spoon in the longan jelly, adding longans and rose petals. 1) Dissolve the gelatine and sugar in the water, heating gently and stirring well. Add the coloring and rose essence. 2) Spoon into the mould on top of the longan layer and add the rose petals. DO this several times, stopping in between to let the jelly almost set before adding the next bit of jelly so that the rose petals and longans don't float. 1) Dissolve the gelatine and sugar in the 2 T water. Cool. 2) Whip the cream until stiff, adding the rose essence and coloring. 3) Using a small whisk, whip the gelatine and cram together. 4) Pour onto the middle layer. Let the top set a little in the fridge, cover with wrap and leave in fridge for 6 hours. p.s. I keep all my jelly ideas in a book. When I wait for my son (school and tuition classes), when I have dinner out and when I go to bed, I write my ideas (and those that readers have given me; thanks!) down in a book. It is also easier to make changes on when I am actually making the jellies. I just realized that I forgot to make the creme anglaise, in my hurry to post this recipe but no worries, the rose mousse makes up for it and Almost Ispahan is good to go. i usually browse your blog in silent admiration, but i just had to say something about this post. really pretty! another nice creation! love this pinky jelly! wah another winner...one after another..trust me. Terri, This is very pretty creation, simple awesome ! I really like your incarnation of the Ispahan, it is gorgeous and well thought out! Did you find the petals "catchy" on the palette as they weren't melting and soft like the jelly? Ispahan! !Ok now i got to do it by myself..I dunt have roses in my garden..arrghhh..by Im dreaming to taste it now.really gotta give a try..Good job dear! Oh my... hong yi sent me here but this blog is amazing! for food lovers like me.. can salivate while reading! Did u end up doing a 3rd jelly?? and how did the frozen one taste? I love love love this! To me, it's the best creation so far in this competition. I changed my mind about the pink guava, it"s no. 2 for me now. I want t add that i can feel the deliciousness of it without having to taste it. Go go go! martyna: no bc i chewed them up! jimmy: you wouldn't want tt wish bc it means eating A LOT of funny jellies. sharon: i think so too:) i also like the kinabalu:)but i've got lots more ideas coming up! visit often! 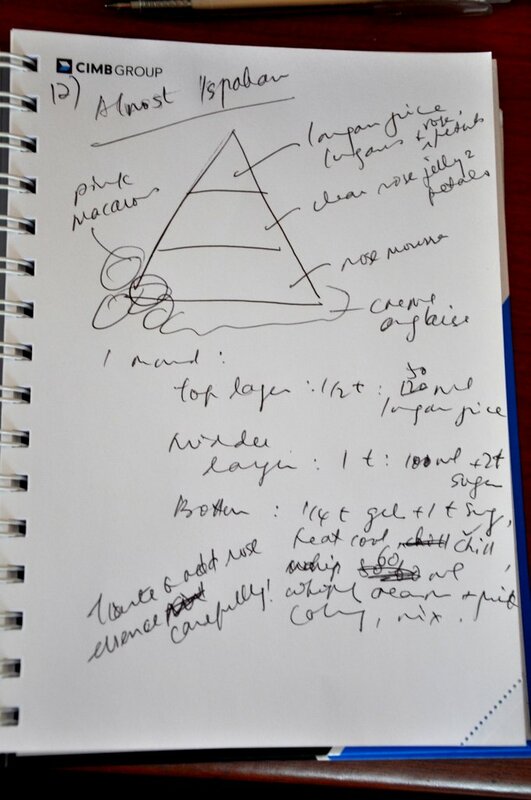 I was wondering why lately every recipe is an cone or a pyramid. Now I know, why. Colourful, imaginative and looks yummy. Wish I could try them. An interesting challenge you set for yourself. All the very best. Looks really pretty! Love it! Love the colors! It's been fun looking at all the jellies. Another beautiful Jelly, Terry! You've really got me hungry for rose. simon: oi yoh, so slow!tt means you haven't been here for a while. ming, runningbrook: i need to bc i'm so forgetful! nate: thanks, so is your terrine!